Tiger Woods PGA Tour is a big game. I’m talking 160 MB big. Is it worth the $10 price and the oodles of disk space it’ll gobble up on your iPhone? 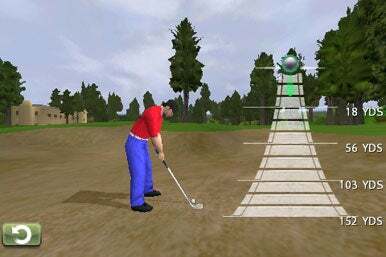 If you’re into golfing sims, the answer is yes. Tiger Woods PGA Tour is one of the deepest, feature-rich games I’ve encountered on the iPhone. In spite of a few flaws, the game—packed with options, numerous courses, top-notch graphics, and an impressive soundtrack—rocks. Non-golfers will love the in-game help and explanations, while golfers will appreciate the attention to details of the game that you’d expect from Tiger Woods and Electronic Arts. It’s In the Hole: The unique swinging mechanism in Tiger Woods PGA Tour is a delight to use once you get the hang of it—even when you’re in a sandtrap. PGA Tour grants you three separate profiles, so you can share with a friend, or just create multiple characters. You can choose your golfer’s skin tone and clothing, or choose to play as Tiger himself. The game excels in letting you play whatever and however you’d like. You can choose to play solo or against up to three other human (via pass and play) or computer-based pro opponents. You can choose between a variety of scoring rules, from traditional stroke play to modified Stableford. (Luckily for golfers who are more familiar with courses that contain windmills and trapdoors, the game explains those different rules pretty well.) You can choose to play as teams or individuals, pick from seven actual, beautifully rendered PGA courses, and play three, five, nine, or 18 holes. You can get even more granular with your settings before you tee off. You can choose your tee color (which determines its difficulty) and pin difficulty, and set the speed of the green, fairway, and rough (which affects how the ball rolls there). Wisely, with all those options, PGA Tour offers smart defaults for when you just want to start golfing already. On each hole, the game provides a (skippable) overview pan, really showcasing some excellent artwork, and impressive iPhone performance. Your golfer moves around while he waits for you to set your shot up; he shifts his weight, adjusts his hat, steps back, and it’s all handled very realistically. You choose your club and swing form, and when you’re ready to begin, you use PGA Tour’s unique swinging mechanism: You drag your ball down the slider; the lower you drag, the more powerful your shot will be. When you’re happy with your power level, you drag the ball back up, and the straightness with which you do so affects your shot. Arc to the left or right as you drag your finger back up, and the ball will take a similar path. The smoother your dragging maneuver, the more accurate your stroke will be. It takes some getting used to, but it’s a delight to use once you get the hang of it. Putting uses the same interaction, though I did find it a bit harder to pull off consistently. PGA Tour offers great in-game tutorials. You’ll see a lot of loading screens in between holes, but at least there are gameplay tips on each one. The game also offers commentary, which gets a bit too repetitive and robotic sometimes, but is still a nice touch. Playing against computerized opponents works great; watching them is impressively similar to watching golf on television. All the in-game camerawork is exceptional, in fact. Tiger Woods and EA have put out an exquisitely detailed golf simulator. It’s fun to play, again and again, and offers an immersive experience second to none on the iPhone. Tiger Woods PGA Tour is compatible with any iPhone or iPod touch running the iPhone 2.2.1 software update.